And this time I’m doing a dessert—homemade Schnickers Bars—after two rounds of main courses. If you want to check those out, they are here and here. I’m happy to say that you can make this a raw vegan dish, but I used roasted salted peanuts and roasted peanut butter, so it’s not technically raw. You could make this paleo by subbing the peanuts for almonds, but I didn’t have time to do that. But at the rate these treats are going to get eaten, I’ll have a chance to try that out very soon. When I found this recipe I was so excited! I have changed it, and frankly, the original left a lot to be desired. Not so much on the concept—which of course is awesome!—but on the execution. I don’t know about you, but I’m not a chocolatier, and need a little more explanation than “Coat the sides of your container with chocolate.” How? How do you get it to stick to the sides of a silicone container? And also, they said to make the chocolate first, and didn’t tell me why. Now I know it’s because it needs to cool down a bit so that it gets less runny. So please, make the chocolate mixture first. Another thing that bugged me: “Add the caramel”. Okay, sure. HOW do you add a bunch of sticky stuff to a pile of chocolate and peanuts? Help me out here! I muddled my way through it, but seriously, they could have given the reader a little more to go on. But when you know you’re going to basically have a version of a Snickers bar without all the crappy soy-lecithin laden chocolate, corn-syrup caramel and a dozen other ingredients I can’t pronounce, you persevere. And it was worth it. It was so very worth it! Note: I used both a big silicone ice-cube tray and a regular standard ice cube tray for these. The silicone made it marginally easier to get out, but I like the miniature size of the regular ice-cube tray variety. Up to you! I’m sure there’s candy bar-sized silicone trays out there to make full-sized bars with. Have fun! +++NOTE: I remade these recently (September 2013) with almonds instead, so I’ve changed the recipe. You can use peanuts if you want, like the photo, but man, the almonds are SO much better! And totally Paleo! Place chocolate ingredients in a blender or food processor and blend until smooth. Pour into a pitcher to make it easy to pour the chocolate with control later. Set this aside in a cool place. Blend all caramel ingredients in a food processor until smooth. You’ll need to scrape the sides down once or twice. Place the caramel into a pastry/frosting bag or into a plastic bag. You can cut the corner off to use as a pastry bag. 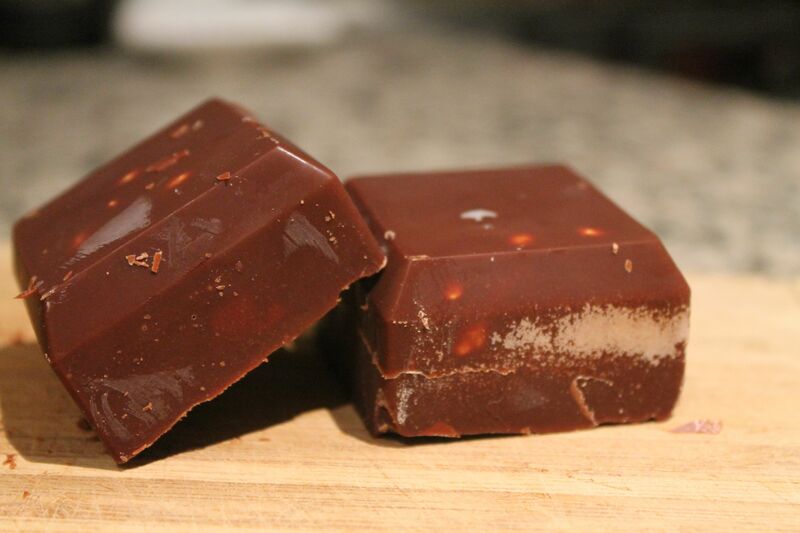 Coat your silicone molds or ice-cube trays’ bottom and sides with a fairly thick layer of chocolate. How? Well, make sure the chocolate is at a temperature where it’s fairly thick. Pour an equal amount in each of the molds and gently tilt the mold to coat the sides. I would suggest doing this little by little, adding more chocolate in stages to coat them well. Once you’ve got a good, thick coating, place it in the freezer for a few minutes. 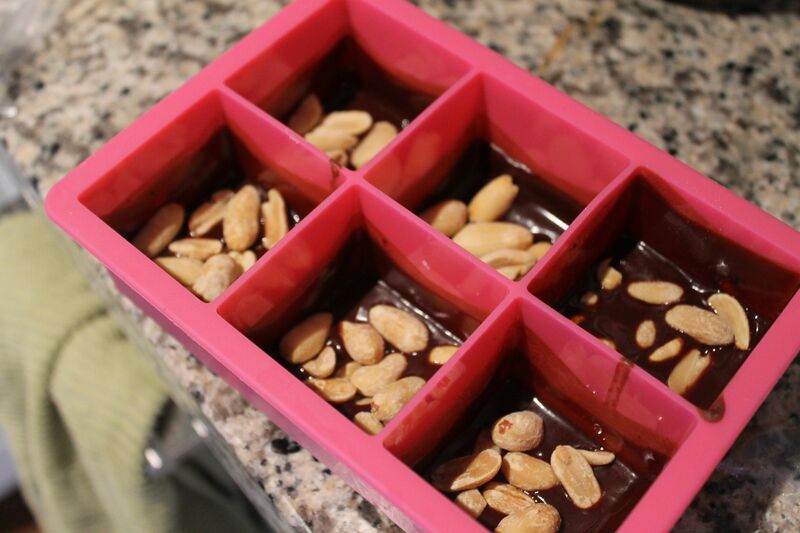 Cover the bottom of each chocolate with almonds. Using your pastry bag, add a good dose of caramel, and use the tip of a butter knife to smooth out. Pour the remaining chocolate on top of the caramel, coating well. This “top” of your chocolate will actually be the bottom when you pop them out! Gently place in the freezer on a level plane for one hour. During this hour you may need to leave the house to refrain from eating them. I must admit using the peanuts to dip into the leftover caramel while I waited for them to be ready. If you used regular ice-cube trays, run a little hot water over the bottom of the trays to loosen them from the sides, then pop out over a rimmed cookie sheet or tray to keep them from scooting off the counter and on to the floor. I ate the one that fell anyway, but this way you can learn from my trials and not have to wipe off the cat/dog fur before eating any of these little darlings. If any survive the first outing, keep them in a tightly sealed container in the freezer until serving. By the way, I didn’t do half of the things I’ve said to do here, and mine still turned out very tasty. Take 1 cup of raw whole almonds (get the ones that are labeled “Italian” or “European”, as they will be truly raw and unpasteurized) and chop them up roughly. I love roughing up my ingredients. It makes me feel big and mean. Toast them in the oven or on the stovetop in a frying pan. Stir often if you’re using a pan. Once they’re pretty toasty all over, add about a tablespoon of almond oil and coat well. Carefully pour out the almonds onto a plate covered in paper towel and blot most of the excess oil off. Salt them with sea salt generously. Set aside to cool before using in the recipe. Now, if you’ve just jumped to my blog from my Facebook post or whatnot, please go back and visit Ode to a Mung Bean’s post by clicking on the link below. They’re from the UK, my old stomping grounds! So really, their dessert will be called a pudding. And they do awesome puddings over there! You made my day…. vegan homemade schnickers! AWESOME, bookmarking this…. I ❤ making someone's day! Thank you so much! And Happy VVP 3.0 Day to you, too! I know, right? Just wait til you make them… Thanks for the comment! Indeed they are! Thanks so much! Your cupcakes look divine too, BTW! You just made my day. I am so excited to try this recipe. I love that it’s raw. Thanks, Ula! Just make sure to use raw peanuts and you’ll be all set. And I can’t think of a better compliment than I just made someone’s day, so thank YOU! Yes!!! This looks so easy and delicious. I think I have most of those ingredients in my cabinet so I will have to make this soon. Oh how I wish I wish we could turn this virtual potluck into a real one right now so I could gobble these up. You know what? Me too! And I’m away for the weekend, and they are in the freezer at home…. OH MY GOSH! I need to make these!!! My reaction exactly when I saw the original recipe! Please tell me how they turn out, and if you have any further tips to share. Thank you! And they are so good. And relatively easy to make! Enjoy! HOW awesome are you for this? VERY FREAKING AWESOME. Kammie, I had the same reaction when I saw these! I haven’t had a Snickers bar in years because of all the dairy and weird stuff. So thank you for the comment, and let’s stuff our faces together. Cheers! ahhh how exciting. I have missed snickers. Can’t wait to make this. Thank you! I hope you can enjoy them soon. My favorite part is that the caramel isn’t so sweet that it hurts your teeth! Blown. Away. You smacked it on down, babe! Thanks Annie! The VVP deserves one’s best. All the work you guys put into it…well, I wish I could have sent you a box of these! Oh man…you tease ;-)! I’m making them – absolutely! omg omg omg. want now! Your comment makes me very happy. 🙂 thank you! Wow, what a wonderful comment to receive! I’m so flattered! And I hope you found all the other awesome recipes on the VVP. Welcome! Yummmmmy! I WILL be trying this soon!! Happy VVP! That is great news! It’s great to have a recipe others want to try. Thank you! And Happy VVP to you too! Wow this dessert is amazing – I LOVE it! A must try recipe! Thank you! Thank you! I must admit, the taste is worth the effort. Enjoy! Thank you! I can’t wait to play with the recipe a little bit. Happy VVP! I totally agree! There was a lot left to the imagination on the original recipe. Thanks so much for stopping by! Happy VVP! Wow! I love that these look crazy delish, but are not full of refined sugar. Isn’t that a bonus? I like how few ingredients there are, but the result is still very high in yum factor. Thanks for the comment! They are not lasting long in the freezer just for that reason! Yum, indeed! Thanks! I am soooo drooling 😉 those look deee-licious!! Thank you! Your sliders seriously made me drool! Trying out that bacon and your bread STAT. I’m not vegan either (as you know, fellow lamb lover! ), but these *are* so much tastier than the real thing! They lack all the chemicals and crappy chocolate. And easily switched up to other nuts to suit your fancy. Almond? Macadamia? The sky is the limit! 🙂 Thank you! Yup, that’ll do just fine. I’m pretty sure there’s nothing better then homemade candy bars. Crazy delicious looking! Thanks so much! I can’t wait to play with the recipe a little more. If you make them, please share any tips or improvements! Oh wow. This is my first visit to your blog (I love this potluck thing… so many awesome blogs!) and this recipe is like… well, hitting the goldmine. I love Snickers bars but often avoid them as they’re so bad for me! This version is gorgeous… deliciously good coconut oil and wholesome ingredients. The sugar content? Bah, I need it to keep my brain going. Yup! Making these!!! Oh my, so decadent! I must give these a try…today! Wow–thank you!! I hope you do! I’m sure you’ll come up with some improvements, and if you do, please share. This looks dangerously good! I can feel my love handles expanding as I pin this recipe to my board…Thank you! 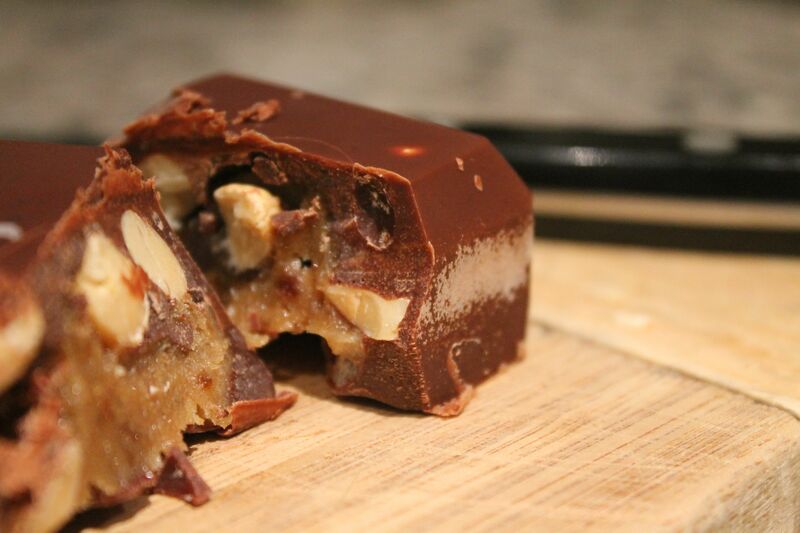 raw snickers! I must try! I’ll be interested to see if your little ones enjoy them. I’m sure they will–even though they’re not as sweet as regular Snickers, I think that kids will still love them! Oh, yum. These look A-mazing! Can’t wait to make them! We just finished that first batch the other night. I’m waiting for The Husband to request more! If you do make them, please share any other improvements or tips to make the recipe work better. I feel it could use a few more tweaks! Heavenly! This looks out of this world. Thanks for sharing and taking the time to type out such a good recipe and explanation, I share your frustration for badly explained recipes! Some internet recipes are just rubbish, with no specific details about the ingredients or on how to actually complete the steps. 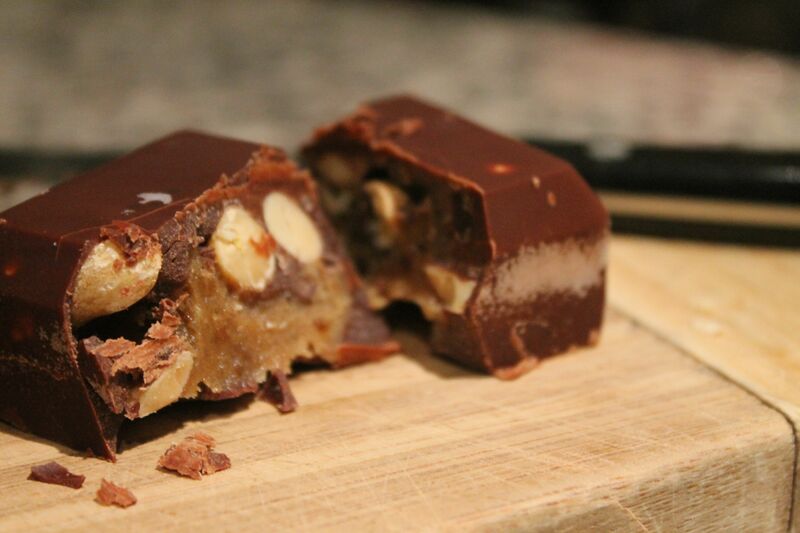 I’m a huge fan of a snickers – so I’m bookmarking these to try! Thanks for the support! I mean, the whole point of a recipe is to tell someone HOW to do it, right? Otherwise it’s just a list of ingredients!! I’m glad you’re going to try them–they’re surprisingly simple and worth every minute spent making them. Enjoy! And let me know if you find any other tips or improvements on the recipe! i though that you’ve using chocolate bar for this..
Holy crap! These are amazing, I love love love Snickers! Wow. You have blown my mind. Thank you so much! My mind was blown when I found out how relatively easy they are to make. And delicious? Hells yeah! Thanks for stopping by and for the comment! Dang, you’ll put the Mars Company out of business with this version of a Snickers Bar! Looks awesome. Wowzerous! That looks even better than a regular snickers bar. I use a lot of coconut oil when I cook at home- for south Indian dishes- but does it leave a coconutty aftertaste when paired with chocolate? I am yet to try it in a bake or dessert. This looks really, really good! And to think it;s all natural with no high fructose corn syrup! It *does* leave a bit of coconutty aftertaste, and next time I’m going to try it with butter instead. ahh these look excellent. Thank you! I hope you try them! Pretty easy and definitely worth the effort!